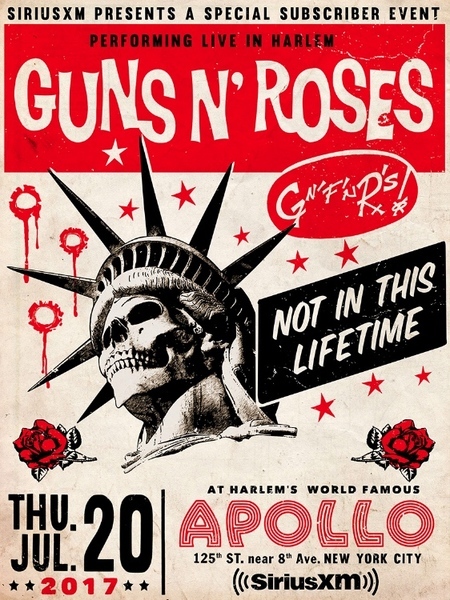 SiriusXM announced today that Guns N’ Roses will perform at Harlem’s world famous Apollo Theater for a special invitation-only concert for SiriusXM subscribers on Thursday, July 20. Howard Stern made the announcement today during his live SiriusXM show The Howard Stern Show. The exclusive SiriusXM concert marks the first time that Guns N’ Roses will perform at the iconic venue. The special event, taking place before the next leg of the band’s North American “Not In This Lifetime” tour, will air live nationwide on SiriusXM’s Guns N’ Roses Radio. The concert will also air live on Howard Stern’s Howard 101 channel. SiriusXM’s Guns N’ Roses Radio will feature music from the Rock & Roll Hall of Fame inductees entire iconic career, including the 1987 Appetite for Destruction album, which is celebrating its 30th anniversary. The SiriusXM channel will also include music by artists who have influenced Guns N’ Roses, live tracks and rarities. Guns N’ Roses Radio will launch on Thursday, July 13, via satellite, and through the SiriusXM App on smartphones and other connected devices, as well as online at siriusxm.com. Nightrain members, stay tuned for info on how you can get to the Apollo!